I would like to start off by thanking Spike Page for being the inspiration for this project. A couple of weeks ago, Spike wrote on Spike’s Facebook page asking for someone to test out a Google Earth file. This file contained volcano webcams from all over Central and North America. Having tested the file and confirmed all was working, I got to think as to whether there was any way of embedding this information onto the site for easy viewing. This led me to Cesium. Starting with a blank canvas, I first needed to make sure I was going to be able to embed the different elements that I would prefer to use, mainly .kml files. These files are used and generated in Google Earth and display location data for objects and various locales around the planet, so using this we can plot any point, generate a .kml file and have it imported into our Map. Luckily for us, this file format is also generated and used widely by many sources on the web, some of which fall right into the type of information that we would want to use, such as the Smithsonian Global Volcanism Program. The Smithsonian Institution has a list of all the volcanoes on the planet and has generated a .kml file with all the volcanoes marked (They also generate a weekly report, which will be added at a later date). One downside to Cesium is that it doesn’t provide any options for loading individual items from inside a .kml file. This means that whilst the Google Earth file creates a nice, neat selection of folders all regionalised, Cesium loads everything into a huge eye-wrenching muddle. I have gone through and broken the Smithsonian .kml file into smaller regional chunks that can be turned off and on for ease. Each volcano marked can be clicked and a pop-up information box is provided by the Smithsonian. Another resource I have added is the earthquake layer. Using .kml files generated by the US Geological Society (USGS) and their European counterparts, the European-Mediterranean Seismological Centre (EMSC), we can view all the earthquakes from around the planet from the past 7 days at a magnitude of 1.0+ from the USGS layer, or from the past 2 weeks at a magnitude of 2.0+ from the EMSC layer. These files are kept up to date in almost real time by the organisations in question, however, they provide all the markers that go along with these files and this means we are limited in what we can do with them. For instance, personally I find the USGS data much more pleasing on the eye, it is simple to view and understand with each earthquake colour coded depending on their age and the marker for them resized depending on magnitude. Simple to understand at a glance. The EMSC data, however, is not colour coded depending on the date, its colour coded depending on the depth of the earthquake. The markers used by EMSC are also different, whilst the USGS uses solid circles, EMSC uses only the outline of circles meaning these are more difficult to see. So, why did I not just use the USGS data? Unfortunately, the data provided by the USGS is, perhaps unsurprisingly, US-centric. They do provide markers and data for quakes all over the planet, but the coverage in Europe is very limited, whereas, EMSC lists all the quakes in Europe. At this point, I was happy with what was achieved, we had a viewer that showed all the volcanoes around the planet and all the earthquakes. I started to plan what I was going to add next, Spike had already provided me with a list of webcams in a handy .kml file, so this was probably going to be my next layer to add. Then I received a new version of the file from Spike, and it contained a wealth of new data. Spike has not only tracked down many webcams from around the planet, but added data from Iceland, Italy, Indonesia and New Zealand, such as live seismograph data, and strain and tremor data. When I saw the Icelandic data, I knew I had to get it added! One of my many volcano-related bookmarked web pages was the map of Icelandic drumplots. This provided an at-a-glance overview of what was happening in Iceland and made it very easy to pinpoint, or at least hazard a guess as to the location of an earthquake that appeared on the traces. For some reason, IMO decided to remove this functionality, but now we have been able to restore this data onto our map for the world to see. In the short term, I will continue to add more data from Spike. As I stated above, the file Spike sent me has a wealth of data to be added. Next up will be the seismic data from Italy, Indonesia and New Zealand, as well as the tremor and strain data from Iceland. Then I will start tackling the webcam. The Webcams, if all works as I hope, will show a thumbnail of the current view from each location. This will update as the camera updates meaning we have another at-a-glance view of the situation. Hopefully, I can post these cameras as close as possible to their actual location, meaning we can see roughly where we are getting each view from. This will mean we will be able to get a clearer idea of where any activity view is coming from. Medium term plans include a better menu layout for selecting the different viewing layers, this is pretty low on my list at the moment, but is pencilled in for a future revamp. Also planned is adding a search function, there was one originally in Cesium, but this only allowed searching for cities and the like. I would like to be able to search for a specific volcano and for the map to take us to it, but as it stands this function is disabled. Another future update will provide 3d terrain. I can actually add this now, but when I do it causes a lot of the layers to vanish underneath the terrain, so again this is disabled. Longer term plans are open for discussion. What would YOU like to see added? I do plan to add more and more data from around the planet as time progresses, but if something specific is suggested and approved, I will get it added. I hope you enjoy using the program and any suggestion for improvements will be taken into consideration and implemented if possible. Just watching Agung is that a fire on the top of the crater on the right hand side? OOPS could it be a flashing star ? Tommy, Once I’ve finished my Icelandic volcanic feature mapping project I’ll send you over the files so you can add it as an overlay. Although knowing my time scales that could be months away! Congratulations and thanks to all the contributors. fantastic resource…. And as soon as I get a chance I’m going to have a play with it. And Janet, yes, a star I believe. It had me guessing too, a couple of nights back. Great work, thanks a lot! I think the next thing to add should be a link from the front page or side menu so it is easy to find, even after this blog post has cooled down and is sitting somewhere in the partially crystallized mush of old blog posts. Terrific idea…and the time it must be taking is laudable (at the very least)! Much appreciated from my end to all who are contributing to the project. Amazing work – well done! Thank you! To do a screen grab and paste, you need to first click anywhere on the open page (or graphic), then hold the ALT button while depressing PrtScr. The open page image is now on your clipboard. I like to paste the grabs into a Powerpoint presentation, since it will resize the image as well as automatically compressing the file size for easy uploading. To view your grab, open Paint, or like I said Powerpoint (or equiv), and paste (Ctrl+V) your image onto a slide. Make as many new slides as you want if you want to save multiple screenshots into a single file. Once you’ve pasted your grabs, click SAVE AS. I save the file as a “project” first, then save the slides again as individual files. You should have multiple choices of formats to save each slide as: I use .jpeg, but higher resolutions (larger file size) can be had using .gif or .tiff formats. Still working in my shop… doing a late one tonight. Still absolutely no sign of any image anywhere. If you’ve got windows 10 you should have a program called ‘snip’ or ‘snipping tools’. Use that for screenshots and see if that helps. This will be a wonderful addition to the site. My bring lots of new visitors once word is out. 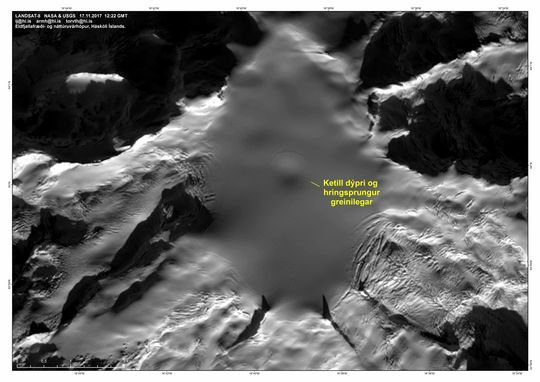 Öræfajökull up to yellow on the IMO site due to appearance of new cauldron and increased seismicity. Well, what a sudden, unexpected turn of events! “New satellite images of Öræfajökull volcano shows that a new ice-cauldron has formed within the caldera in the last week. Pilot flying over the area took pictures of the cauldron today and sent them to the Icelandic Meteorological Office. The cauldron is about 1 km in diameter and it reflects a recent increase in geothermal activity within the caldera. It seems that geothermal water has been slowly released from underneath the cauldron to the glacial river of the Kvíárjökull outlet-glacier (SE flank of Öræfajökull volcano). Associated with this water release sulphur smell has been reported nearby Kvíárjökull since last week. Most of the water has probably already been released. An increase in the seismic activity has been recorded for the last few months, but for the past days it has been low. This data indicates increased activity of the volcano which has not erupted since 1727. Currently there are no signs of an imminent eruption. New cauldron clearly visible! Could things be ramping up a lot faster than expected? Jon made a new post on his site where he said magma is at 1 km or less below the surface. I dont know if that is 1 kn below the actual ground or 1 km below sea level ( which would be about 3 km below the summit of the volcano) but either way if he is right then this could be the next eruption in iceland and it could be soon. It also probably wont be that big as its previous eruption was also quite small but it could be ashy from all the ice. Actually the situation is very similar to eyafjallajokull in 2010. GVP says that basaltic eruptions have happened outside its caldera around the base of the volcano in the holocene before, and given how close it is to the ocean and main road it could be interesting. I queried on the previous thread about the stability of the glaciers on Oraefajokull. Thinking about it, are there any concerns about the stability of the volcanic structure itself? It does look rather steep sided for a volcano, a bit like mount hood. It doesnt really look that steep to me, only compared to other volcanoes in Iceland which all seem to be unanimously shield volcano shaped (except hekla which actually is steep in most dimensions). Its probably not steep enough to collapse under gravity, but given the warming climate a large eruption might be enough to almost de-glaciate it. Because its last big eruption was before the little ice age it is possible that the existing glaciers are mostly relatively recent and have formed since then after being destroyed in the 1346 eruption. I love this new resource! And just in time for Iceland’s new adventure! Although I think Öræfajökull hasn’t yet fully committed to an eruption. It could still back out. How do you think Herdubreid is getting on ? There seems to be fairly constant low level shaking going on there. I don’t know what to make of Herdubreid. It seems tectonic but it has been going on for a long time now. I was wondering whether it is busily accommodating the rifting that occurred during Holohraun. At the rift, there was a fast widening, but far away, the plates are moving at a constant speed. So the judder of Holohraun needs to smoothed over in between. But I am sure others will say it is just a bit of restless magma.. This was quite a bad year for cyclones. From August to mid October, every tropical storm in the Atlantic became a hurricane, and from mid August through September, all but one reached major hurricane status. Is this actually a record year? I dont think so many category 4-5 hurricanes in 1 year has ever happened in only one area before, maybe worldwide but not so localized. Plus a medicane (Mediterranean hurricane) as of now. I’m looking forward to the end-product and am glad it will have a good permanent home. I know the seismogram was stuck yesterday, and it is still stuck. I want to say that the situation has rapidly became dangerous in Oraefajokull. Somehow we are all caught by surprise of the speed that the magma in this volcano travelled all the way to near the surface. It´s not the major news in Iceland, the risk of an eruption at Oraefajokull, especially as this volcano has the largest explosive eruption of Iceland´s 1000 year old history. A VEI6. At same time there is an unusual cold wave affecting now Iceland, with afternoon temperatures down to -10°C, and night temperature will be down to -20°C or even -30°C in parts of the country. Unusual for November, and with continuous northernly wind, an eruption at Oraefajokull would feature a worst case scenario if it would start in soon. Quite impressive is the fact that over the past 7 years there have been minor glacial floods (with sulfur smell) from the rivers coming of Bardarbunga or Kverfjoll (still unknown which of these was the source), Oraefajokull, and Katla in the past few hours. Even if very small these floods are dangerous because the sulfur gas is poisonous. How deep does magma have to be to start creating cauldrons? On Jons site he said it is at a depth of 1 km ( I dont know if it is 1 km below sea level or 1 km below the actual ground which would be above sea level). I would have thought magma would easily erupt at those depths just from decompression if it is new mantle magma like it probably is in this case. I find it hard to contemplate living in a place that is colder than my freezer (-22C)… 🙂 I would still go there though. We can´t be sure if magma is at 1km. I think its shallow yes, maybe 3km, but probably the bulk of it is deeper. Still an eruption would probably happen sooner what we expect if things continue this way. The eruption in 1362 was violent and short-lived. It blew 10km3 ash. Being outdoors with -15°C is cold but nothing that bad. With -20°C it starts numbing your fingers if you are out for some time. With -30°C it starts to hurt in the extremities of the limbs and also numbing; frost bite is much more likely. Still if well dressed, you can be comfortably outdoors for an hour or two. I guess this is nothing compared to the -50°C that occur in Siberia, where you can´t be outdoors for more than 5min. With wind it is much worse, which is common in Iceland. The cauldrons form from heat, not from magma. The best way to get heat to the surface is by circulating water. What has happened is that the magma came high enough to reach the water circulating in the upper crust. It will be higher than 5 km (below that there are no holes in rock, needed for water to circulate). You should take the dept from the base level of the edifice. Even at a few kilometer, it is not guaranteed that magma will reach the surface. Dykes can get stuck there. It will not be large liquid chamber: that would be unstable at shallow depth. Instead, magma will in sills and dykes, with lots of rock for support. If it is very shallow, melting of the ice cap itself could reduce the pressure enough to allow for an eruption. Perhaps that is what sets off Katla as it is seems seasonal in its eruptions.